The trickle of news about Microsoft’s Courier device continues, and this time there’s a bit more of a realistic walkthrough. 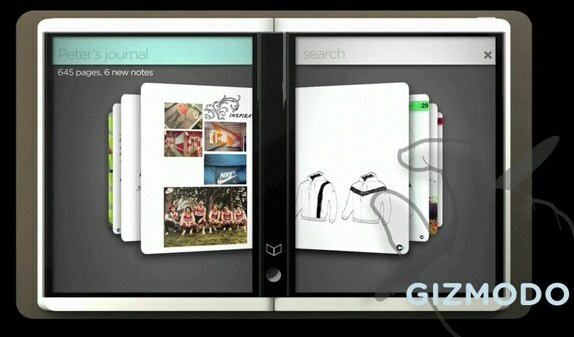 The device is being shown to be much more of a next-generation notepad than all-purpose tablet, and that’s probably for the best; Microsoft overreaching with a device like this could result in a real crash and burn. I suppose the best way to picture the Courier is just as a web-connected organizer — you know, one of those leather-bound ones that business people used to have, and which the Courier seems clearly designed after. Of course, with an internet connection and full-color touchscreen, much more is enabled and the device becomes much more complicated. Microsoft’s (and Pioneer’s) task has been to pare that down to a product, and it really looks like they’ve done it right. You’ll note that the video above shows absolutely no reference to music or media, and the minimal menus shown don’t show any connection to such functionality, although to be sure there could be a gesture they haven’t shown us which hides and shows the media player. There is a camera on the back, though, so there must be at least rudimentary photo organization. The one exception is a “watch” button next to an incoming item in the calendar mode, so it will have playback capability, which implies audio as well. The preceding limitation sets it apart from our own CrunchPad and other all-purpose tablets, which are designed for light internet use and web apps, and the Apple Tablet, which is presumably is orientated toward media playback and possibly some gaming. See, we can all get along. The default interface appears to be the “infinite journal,” which can hold rich content and be shared, searched, and downloaded. An endless piece of paper, or really corkboard, to which you can attach web clips, pictures, notes, and so on. Aside from that there appear to be standard gestures for displaying your calendar, displaying a paint application, and so on. The center area works as a clipboard, which is a very smart way of utilizing the dead space necessitated by a folding device. The actual physical interface (the touchscreen, that is) remains a mystery. The finger gestures are pretty coarse, but that doesn’t mean it’s all resistive. But the pen is clearly a resistive tool, so it’s not all capacitive. 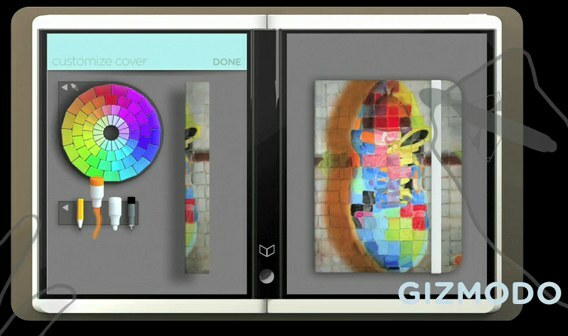 There is the possibility that it is both, like what RIM was working on. In fact, if a design team were given a dual-touch-mode screen, I wouldn’t be surprised if a Courier-type hybrid was the first product they devised for it. That’s just fantasy, though; I’d expect it’s a fully resistive screen, more like a Wacom tablet with “fat touch” optimizing than anything else. Oops — as Lee points out in the comments, the Wacom does not use a resistive screen but incorporates an intelligent stylus and a capacitive screen that is aware by other means of the stylus’ exact location. That could certainly be the case here. One last detail, confirmed by Mary Jo Foley at ZDNet, is that the Courier runs Windows 7, as I’d have expected. 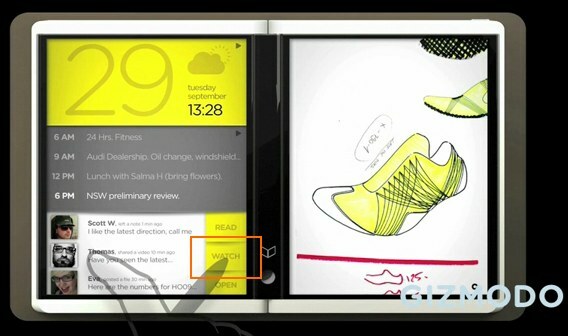 After all, 7 has touch interfaces integrated on the ground level, much of which was pioneered by the Surface team and later added to the OS proper. Building this device on 7 is really the best and only course of action, especially considering its certain communication with Live services. While it appears to have more limitations than we thought when it first broke, it still is an impressive piece of work. I’m running my Microsoft contacts to ground, but it’s pretty clear they’ve already reached a secret agreement with Gizmodo to put out a morsel every once in a while. I’m headed down to Microsoft Hardware HQ tomorrow anyway, though, so I’ll do a little sleuthing.